The devastating fire that engulfed the world-famous Notre Dame Cathedral in Paris has finally been put out, firefighters have announced. The blaze, which destroyed much of the church’s roof and collapsed a spire, was extinguished after nine hours, Paris firefighters announced on Twitter on Tuesday morning. More than 400 firefighters attended the scene, where the blaze broke out on Monday evening. Two police officers and one firefighter were injured as emergency services battled to save the 850-year-old cathedral and the many artifacts and artworks inside. The official Paris fire service Twitter account shared several photos of its staff battling the “horrific” blaze, which sent a plume of thick dark smoke high over the center of the French capital. Though officials initially feared the entire building would be lost, emergency services managed to protect the cathedral’s structure and two towers. As shocked Parisians gathered around the burning famous landmark, responders saved what they could as the fire spread to the wooden interior of the building. Photos from inside the church showed extensive damage. Within just nine hours, the fire consumed much of a cathedral that took 100 years to build and stood witness to all revolutions, wars and upheaval in the City of Lights since 1345. Despite the damage, some of the building’s most intricate and famous stained glass windows were saved. Images of the damage inside the church showed the cross on the cathedral’s altar glowing above the rubble. Firefighters explained that the “difficult fire” began in the building’s attic, rapidly spreading to consume the spire, which soon collapsed. Firefighters are still picking their way through the rubble, and the full extent of the damage is not yet apparent. On Monday night, French President Emmanuel Macron praised the “courage” and “great professionalism” of the firefighters called to the scene. 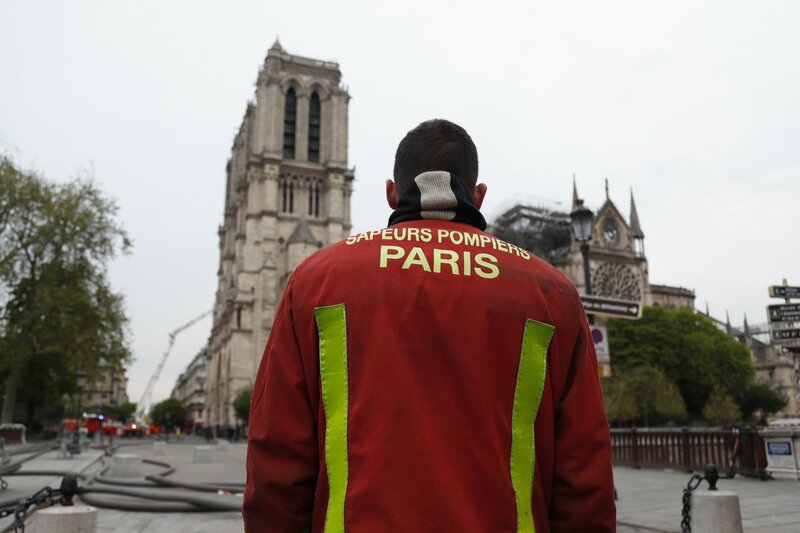 Paris Mayor Anne Hidalgo said Monday that first responders saved invaluable items from the flames by creating a human chain even as the cathedral burned. Macron has already pledged to fully rebuild the damaged cathedral. The Friends of Notre Dame site—set up to fund ongoing renovations—has crashed under the weight of unprecedented traffic, while two French billionaires have also promised hundreds of millions of dollars to fund repairs. A firefighter stands outside Notre Dame Cathedral in Paris, France, on April 16 in the aftermath of the fire that caused its spire to crash to the ground and destroyed much of its roof.